Aaron Brooks (Houston Rockets) – It appears that Aaron’s game is more easily adaptable to Rick Adelman’s system than that of Rafer Alston’s. He’s been productive off the bench. When he did get a chance to start thanks to Rafer’s suspension, he immediately created some fantasy waves. He’s a combo guard so don’t expect him to drop too many dimes. The good thing is that a combo guard is what Houston actually needs to fill its PG slot, since the offense runs through Tracy McGrady and Ron Artest. Rafer Alston’s numbers reflect that he’s lost within the system so far; looking like he doesn’t know exactly where to contribute. For Aaron it’s pretty clear; he’s there to move around while the motion offense is being executed and be at the right place and at the right time to receive the kick out pass from the inside and chuck the ball. Keep an eye on him as he may steadily eat into Rafer’s minutes and maybe even his starting role. He’s had a streak of 3 solid games thus far so he’ll definitely be on other people’s radar as well. Luc Richard Mbah a Moute (Milwuakee Bucks) – Yes I had to look up how his name is spelled; and no, I can’t pronounce it. Fine, I CAN pronounce “Richard”. From the get go he showed flashes of brilliance off the bench and produced some good numbers everytime Charlie Villanueva got into early foul trouble. Now that Charlie is out for a bit with hamstring strain, Luc has slid into the Bucks’ starting PF spot. He is doing a good job thus far. I was cheering for CV to do well this season, but unfortunately he will now get officially stamped with the injury prone label. As a starter in 2 games so far, Luc’s averaging 15 points and 12 boards while chipping in half a block and half a steal per game. Not bad for a replacement PF. He’s probably off the wires in most deeper leagues, but I had to mention him on this list because I would also recommend that people take a serious look at him as a pick up in smaller leagues as well. Chris Quinn (Miami Heat) – I was high on him this pre season and an injury derailed his upside for a bit. Now that he’s healty, he should steadily challenge rookie Mario Chalmers for more and more playing time. The Heat coaching staff have to start balancing Mario’s on-the-court education with the team’s desire to get some wins. Chris is more reliable and is a good combo guard to go with Dwyane Wade. Since the offense courses through Dwyane, Chris should simply bring down the ball, hand it to the superstar and be on stand by for those open 3-point opportunities as Dwyane may look to drop him the ball as the defense collapses on him when he drives to the hoop. The more inconsistent Chalmers remains, the better Quinn’s chances are for increased minutes and fantasy value. Need 3’s? Well Chris is this year’s new Boobie Gibson or better. Brook Lopez (New Jersey Nets) – Now that the shadow of starting center, Josh Boone is away on sick leave through a bone contusion injury; you can look to Brook to log in some serious minutes at the starting 5 spot. He is a rookie and he will turn the ball over and get into foul trouble often, but he does have solid fundamentals and an effective post up game. I’m sure Vince Carter and Devin Harris can appreciate all the help they can get; and no Yi Jianlian’s roller coaster performances aren’t enough to cut it. In his first start he logged in 34 minutes of PT and contributed 25 points, 9 boards, 4 blocks and 2 steals with NO turnovers. George Hill (San Antonio Spurs) – People expected much from Roger Mason, when news broke that Tony Parker would be gone for a long time. Unfortuantely he’s been shooting poorly and the Spurs and Tm Duncan had to look elsewhere for help. In comes, George. He found his shot and his place in the Spurs’ pockmarked offense to contribute 17 points, 6 boards, 5 assists, 1 trey and no turnovers in his last game as a starter. Keep an eye on him to see if he can repeat such a performance on a nightly basis. Anthony Morrow (Golden State Warriors) – Who? Yeah, that’s exactly what I said too. In Nellie’s failed attempts to make useful point guards out of Demarcus Nelson and C.J. Watson, he finally stumbled on Anthony Morrow. Who? Stop that! Yes he is a “nobody” who came from nowhere to suddenly post a 37-11, 4 trey line – at a good percentage to boot. If you’re in a regular sized league, keep an eye on him. If you’re in a deep league, grab him NOW! An ankle sprain is an injury to one or more ligaments in the ankle, usually on the outside of the ankle. Ligaments are bands of tissue—like rubber bands—that connect one bone to another and bind the joints together. 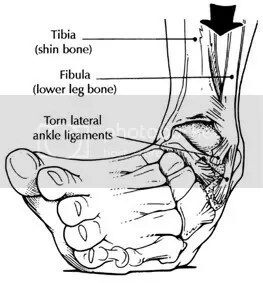 In the ankle joint, ligaments provide stability by limiting side-to-side movement.Some ankle sprains are much worse than others. The severity of an ankle sprain depends on whether the ligament is stretched, partially torn, or completely torn, as well as on the number of ligaments involved. Ankle sprains are not the same as strains, which affect muscles rather than ligaments. Peja Stojakovic (Hornets)- No more worries here. His sprain was apparently mild and rest and painkillers were apparently enough for him not to miss too much time. He’s back and doing well. Michael Redd (Bucks) – He is still out the Bucks’ line up for now and Richard Jefferson and Charlie Villanueva should be logging in some sweet fantasy numbers as they try to fill the scoring void left by Redd. Do NOT bother with Charlie Bell. Even if he’s got the starting job in the interim, he will not amount to anything fantasywise for now. Josh Smith (Hawks) – Out for 2-4 weeks. I actually think he will be back sooner rather than later. In the meantime; Al Horford, Zaza Pachulia, Marvin Williams and Maurice Evans should get some fantasy love in Josh’ absence. Zaza and Evans will have the least upside in the quartet. Devin Harris (Nets) – He should be gone for a few days to 2 weeks. Keyon Dooling will be favored to fill his starting PG gig. Feel free to pick him in the short term and milk Devin’s time away. He is definitely on most waiver wires. Drew Gooden (Bulls) – He has a minor sprain. Joakim Noah now has a chance to shine, well at least briefly. Tyrus Thomas has been too erratic at start the season to tell whether or not he can capitalize on Drew’s short absence from his starting center job. I’m not holding my breath for Aaron Gray to have a micaulous turn around just yet. It’s not as if the San Antonio Spurs were doing great while waiting on the recovery of their star SG, Manu Ginobili. It’s not as if Tim Duncan’s in the his prime nor is he a LeBron James, who on sheer talent and athleticism singlehandedly dispatch opposing teams. After Tony Parker’s monster game where he scored 55 points and chipped in other juicy fantasy numbers, he then sprained his ankle. He is now projected to miss 2-4 weeks of precious NBA and fantasy time. What’s now left of the carcass, formerly known as the San Antonio Spurs? Well it still has its centerpiece, center Tim Duncan. Can you actually call a centerpiece a “centerpiece” if it’s not at the center of anything to speak of? – Sorry Coach Popps, you’ve really got to work your coaching magic and steal some wins on Tim and lot’s of fans’ prayers. Aside from the obvious damage Tony Parker’s time missed will cause to his owners, there are several other repurcussions to this turn of events. Let’s start with the man in the middle. Intuitively, you may assume that Time Duncan will now be great fantasy boon. Please curb your enthusiasm. Yes, he will have some good games as he tries to keep his team above water. You do have to realize, however, that the Spurs’ opponents can simply double, triple, quadruple (this won’t be necessary) team him and shut him down – translating into episodes of poor production and high turnovers. On a more positive note, not all teams have the big man talent to properly contain him; like the Thunder and the Pacers, for example. Roger Mason will now step out of the shadows of the Spurs bench and be the “number 2” guy for the Spurs. Sadly, number 2 is as far as it will go. I’ll get back to that point. Roger is still young and lacks experience on the floor. He will be there to provide an outside threat and be a target for Tim to kick out the ball when he is doubled. He will gets some dimes on his stat sheet as Tim is always a decent assist target. On the other side of the coin, he will get a ton of turnovers and have erratic shooting from the field as he gets used to his increased role and extended minutes. Pick him up. He is odds are, the best in terms of temporary upside on the wires. Michael Finley was a former offensive force back in the other Texas team he used to play for, but sadly the operative word here is former. He may have a few brief moments where he will shine as he will be asked to dig deep and come up strong for the team. He will be inconsistent and he should only be picked up in the deepest of leagues and with caution to boot. The rest of the what’s left: Ime Udoka, Anthony Tolliver, and Matt Bonner will have to step up their games for the Spurs to even hit an above-60 point production every night. Keep your eyes peeled on who turns out like gold (?) – well copper will do for now.